Students in the Long Beach Unified School District signed up for more than 10,000 Advanced Placement college-level exams in 2015, an increase of more than 41 percent over the previous two years. The significant increase comes after concerted efforts to increase access to AP courses and tests. More than 5,200 students signed up for at least one exam. That's about 28 percent more students than two years ago. Individual students often take multiple exams, which are offered in various subject areas. The school district is providing students greater access to AP exams by covering much of the cost for families. AP exams cost $92 each, but this school year students are paying only $5 per exam for an unlimited number of exams. For each exam, students deposit $15 and receive a $10 rebate once the exam is taken. This means that a student who takes five AP exams pays $25 instead of $460. Last year, LBUSD covered the cost of at least two AP exams for seniors at most of the large, comprehensive high schools, while seniors at Jordan and Cabrillo high schools were offered an unlimited number of free AP exams. With the expansion of the program in 2015, the school district provided convenient online registration for the tests. Funding is made possible through the state’s Local Control Funding Formula, or LCFF, proposed by California Gov. Jerry Brown and approved by the state Legislature in 2013. The LCFF provides greater flexibility as to how certain state funds are used by local schools. Parents especially appreciate AP courses because their children can earn college credit while still in high school, saving thousands of dollars in tuition. 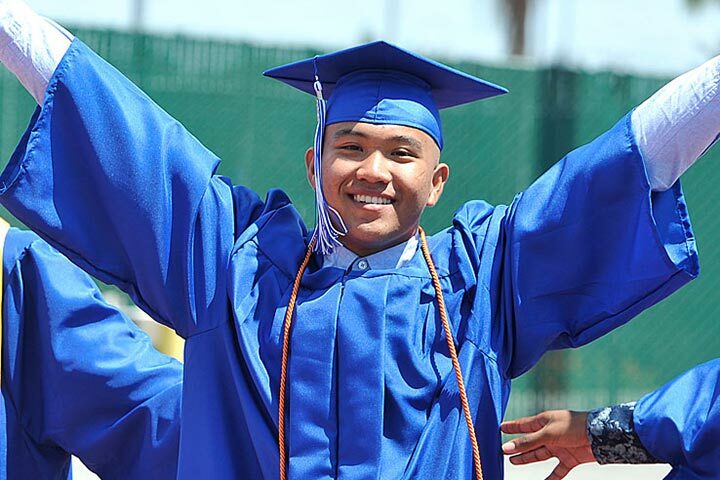 Many LBUSD students earn an entire year of college credit before leaving high school. In the 2015-16 school year, the school district will provide further support by paying for the PSAT exam for all eighth through tenth graders, and by paying for the SAT exam for all eleventh graders. High schools have added dozens of new AP class sections for the new school year. The school district has seen steady, significant gains in AP course enrollment and test registration over the past decade. COLLEGE READY – Students celebrate during Jordan High School's 2015 graduation ceremony.